I have always loved animals. When I was a young girl I toke my grandfathers dog a crossbreeding out for walks. After a lot of nagging my parents did by me a dog. I had study advertisement in papers and decided to buy a Long-haired Dachshund miniature. I gave him the name Sappo, this was 1972. He had not any pedigree, I was very little informed at that time! Anyway we resign to obedience and Sappo and I trained everyday, the last day they had a small competition for all of us, Sappo & I got a second price, as many know the dachshunds can be very stubborn! Sappo he was together with us until he was 12 year. 1974 it was time for the first Labrador, the dog had at list had a pedigree! Then it started with all this shows, fieldtrail and everything belong to dogs! I have had some litters of Labrador and they have than great at shows, fieldtrail and so on. The first Mastiff came 1978. 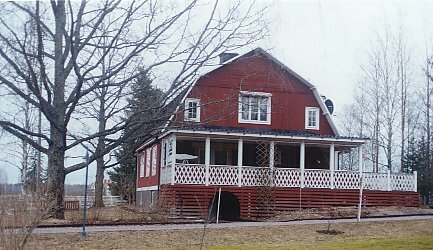 It was the first litter that had been born in 13 years here in Sweden. We had so little to breed from so I had to import some good ones from England to help me carry on with the breeding, they came from Farnaby, Lesdon, Glynpedr, Bredwardine, Jengren, Falmorehall and Maskett. For the moment I have only 2 mastiffs, have not had any litters for 5 years, but in the future I will import something new! Why I did fall in Love in Pugs was accidental occurrence. I was on a dogshow in Boden and saw Humlans Mullrande Muskedunder win the show. He was so beautiful and looked like a "miniature mastiff"! 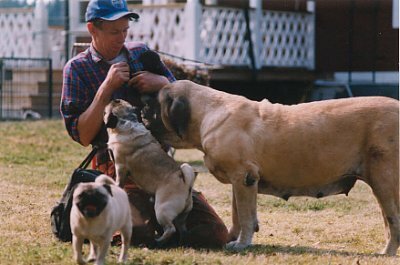 If there was time I always had a look on the pugs at a show, I´m joined there club Mops Orden, visit some breeders in the beginning of 1990, but instead to buy a pug I decided to import two mastiffs from England. Could never let go of the pugs so 1996 I toke the big step and to us came Diplomatic´s Lovisa Ulrika. I´m working during the nights as an foreman and "pappergirl", so I can be home all days home with my dogs, cats and horse. I have also a son Tim, he is born 1974, is not longer living home with mum! My fiance Mats Holmstedt, have a business with excavator. Its funny when we have a look on our photos, I have dogs and Mats he has machines! !